While episode films could have been at times a purely commerical operation, there is no doubt that they also interested directors who sought to express themeselves in a personal way. For example, Nanni Loy, in discussing his film MADE IN ITALY (1966) with the teachers and students of the Experimental Film Center (the state school for future film artists) , had this to say: "I made (...) MADE IN ITALY because (...) it seemed to offer me the chance to give expression in various and different directions, to 'show' a certain quantity of ideas, of stories and images that a one-story film, a self-contained film would have certainly not allowed". 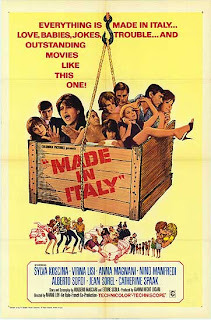 The film, conceived by Ettore Scola and Ruggero Maccari and with a script written by them with Loy, was meant to offer a sort of "guide" to Italy outside of and against the usual tourist format, catching the image of a changing society. In other words, a satirical film, as the titles of the individual "chapters" indicate; Usi e costumi (Habits and Usage); Il lavoro (Work); La donna (Women); Cittadini, stato e chiesa (Citizens, State and Church); La famiglia (The Family). 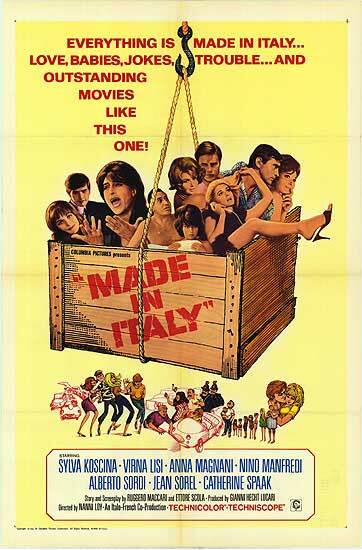 It was interpreted by some of the biggest names in Italian movies, from Anna Magnani to Alberto Sordi, from Walter Chiari to Peppino De Filippo, from Nino Manfredi to Lea Massari, from Aldo Fabrizi to Virna Lisi. Another director who resorted to episode films to carry forth certain rather critical ideas against social conventions was Tinto Brass. Milanese by birth but Venetian by family, Brass utilized the appearance of a UFO in IL DISCO VOLANTE (THE FLYING SAUCER: 1964) to interweave various anecdotes, all entrusted to Alberto Sordi, which as a whole form a satirically distorted image of the conformist mentality of a certain part of the Veneto region (the script-writer Sonego is also from the Veneto) as seen through the eyes of an "angry" and anarchiacally caustic director. The same iconoclastic imagination informs an episode of withering "black humor" directed by Brass and written by Sonego and Alberto Bevilacqua, L'uccellino (The Little Bird), for the film LA MIA SIGNORA (MY WIFE): a uxorcide planned and carried out by Sordi to the detriment of Silvana Mangano, with an elegant and smiling ease of conscience. At the beginning of her career, Lina Wertmuller also used the episode film format to express her ideas in QUESTA VOLTA PARLIAMO DI UOMINI (THIS TIME LET'S TALK ABOUT MEN), written and directed by her in 1964 and starring Nino Manfredi, the vehilce of an amiable but explicit feminist approach to the role and function of women in a "male chauvinist" society.